Your English Bulldog still eats stones in the street? Practical and comfortable, this muzzle weighs little. 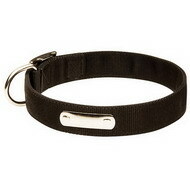 It is well ventilated, tear-resistant, and is very difficult to remove with paws. This universal muzzle model is suits well for daily work, trips, tours, walks. If your dog has post-surgery stitchesm the muzzle will prevent licking them. 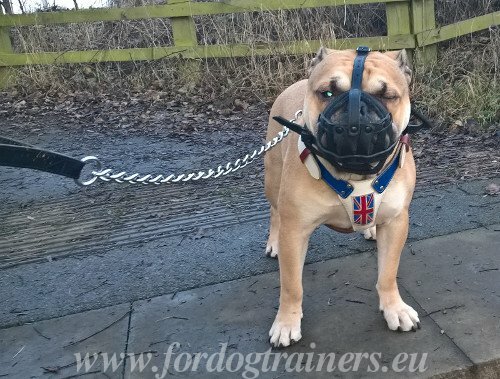 In addition, we have special offers for returning customers - it's obvious that you'll appreciate durability, functionality and comfort of this felt-padded dog muzzle. Having a mixed breed dog is not a problem - we will definitely find superior quality products for your pooch! As you asked me to share my impressions with you, I can not remain silent. I am absolutely satisfied with the muzzle, it fits very well and we have wonderful training sessions. I am happy with the work itself as well. 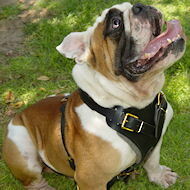 At last we found a fit muzzle for my Bulldog with his huge head! Thank you very much for all of this! I'm also sending a couple of photos as you have requested. The muzzle is padded on nose with thick felt for maximum comfort and to prevent rubbing. 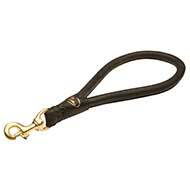 This leather muzzle will prevent your dog from wound licking, eating of rocks, garbage, poison, etc. 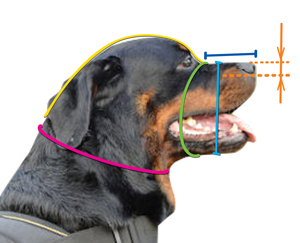 The muzzle prevents injuries from dog fights. Due to policy of some transportation companies your dog will be allowed for transportation if properly muzzled. The package arrived perfectly and we are delighted with the product. Is it possible to order another muzzle for another breed, for a Labrador? 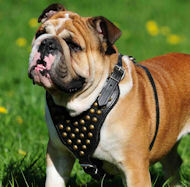 See other Accessories for English Bulldog, Handmade Dog Muzzles, Excellent Training and Walking Harnesses and other outstanding products for your dog in our on-line pet store! Order came today. Thank you very much. 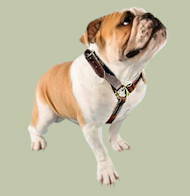 Suitable Bulldog. Best wishes. The muzzle fits perfectly. This is the second time I have bought, and as always everything is perfect. Goedendag, Vandaag het pakje in goede orde afgeleverd. Alles past perfect en ziet er prima uit. Bedankt!